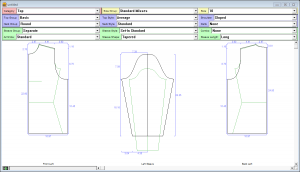 Garment Designer Overview for Windows or Macintosh. This pattern making program allows you to create patterns for both sewing and knitting. It includes libraries of ready-to-wear body measurements, or you can input your own measurements to create a more custom fit. While you work, you can see the shape of your body (the sloper) sitting inside the pattern you are building. If you like, edit the points through click-and-drag, to customize either the fit or the style. Add any extra style items such as collars, pockets, etc. Sewers may then add facings, hems, seam allowances, as desired. Knitters will input their gauge. Print schematics, patterns, and/or knitting instructions. People often ask us, what makes our software different than others on the market. To respond.. we would say. The software is designed and tested by practitioners, textile artists and craftspeople. Our target customer is someone who wants to be creative and/or achieve good fit, yet doesn’t necessarily know a lot about pattern drafting. The program can be used by sewers, knitters, weavers, and stitchers. Pattern editing (for style or fit) is visual, and easy to use. We have built-in pattern smarts, which keep armhole/sleeve and neckline/collar combinations in sync with each other. A symmetry function helps you make changes to the pattern in all the corresponding places at once. We include all pattern sizes (men, women, children, baby, etc.) in one program. We develop for Macintosh and Windows and have for over 20 years. Our audience ranges from home users to professionals in the field.